Happy Fathers Day!!! Another Beautiful Day in Paradise. Bladers/Bicyclers Breeze, Dee T, Dimitri F, Andrew F, Roy H, Nick S, Rob & Amie H, Linda C, Laura P, Dan C, Jim F, Ginnie S & Rick P, Bruce M, Jeff B, Steve G, Carol J, Dorey Anne, Wilma F, Carol K (new), Joe W and Crystal W (missed the picture) came. Welcome all. 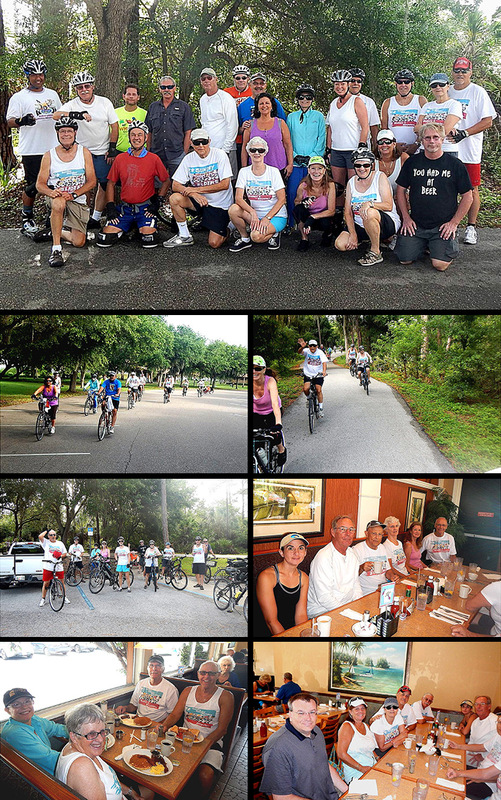 As you can see our new Sunday Blader/Bicycler shirts came in and seven people in the picture are wearing them. Today we took a dual route. The bladers stayed on the Park Trail. The bicyclers did 2 laps (4 miles) on the Park Trail and then did 7.2 more miles with 3.2 miles in the park and 4 miles outside the park for 11.2 miles total. There were 5 Bladers and 18 Bicyclers. We Brunched at Mama's Kitchen as planned. As it was Fathers Day they were very crowded and wouldn't take our reservation over the phone. However after we got there, we only had to wait 6 minutes to get seated at two tables with 11 at one table and 4 at the other. Naturally the table of 4 got waited on quickly and the table of 11 got waited on and served in a reasonable time. We rated the food a 9.5.